Let’s face it: 2015 was a rather disappointing year for active transportation in the City of Vancouver. While there were some modest causes for celebration – namely the unprecedented 1.4 million bike trips over the Burrard Bridge, and the announcement that 50% of all trips are now made by foot, bike, or transit (five years ahead of the 2020 goal council had set) – they were successes achieved on the back of an existing AAA (all ages and abilities) bike network established between 2009 and 2014. During this time, the city saw the construction of six protected bike lanes over as many years. Planners and advocates across the continent heralded the vision and courage needed to make this happen, quickly establishing Vancouver as a North American cycling leader. Metro Vancouver’s ill-fated transit plebiscite in early 2015 was not only a lost opportunity to secure a $161-million fund for walking and cycling improvements across the region. It also stalled any momentum, as six months of staff resources and political capital were directed towards securing a “yes” vote. And so, as the year comes to a close, we find ourselves in an unacceptable scenario. Despite Mayor Robertson and Vision Vancouver being given a third consecutive mandate by the electorate, the City has installed zero new protected bike lanes in the calendar year. While in that period of time, contemporaries such as Calgary, Minneapolis, Denver, and Seattle moved full steam ahead on their own ambitious AAA bike networks. But earlier this month, when City Council unanimously received a staff report laying out the next few years of bike improvements, they made a clear statement they are not interested in resting on their laurels. 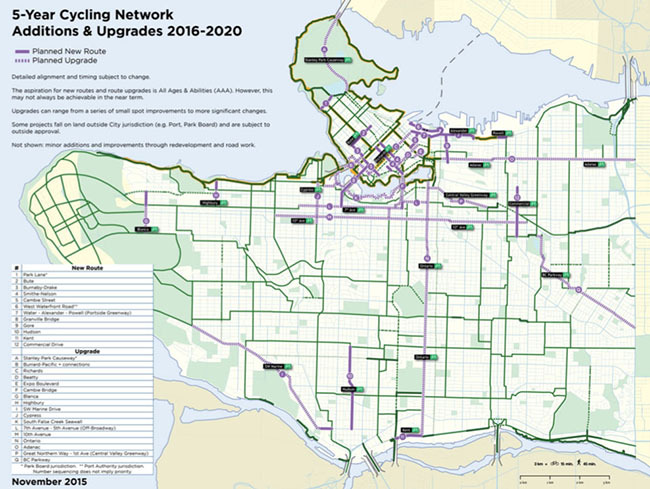 The five-year plan lays out a dozen new AAA routes (many of which, incidentally, were in our January 2015 wish list), including the Burrard, Cambie and Granville Bridges, Richards Street, Cypress Street, Ontario Street, SW Marine Drive, 10th Avenue, Water Street, and Commercial Drive. While each of these individual routes must be consulted, designed, and approved by staff and council, it is apparent that everyone is ready to make up for lost time, and gearing up to make the year 2016 an eventful one. While some cynics may suggest that Mayor Robertson dreamed up these routes and dictated them to his advisors, the truth is actually a lot more scientific, and reflects a bottom-up approach to bike planning unique to Vancouver. 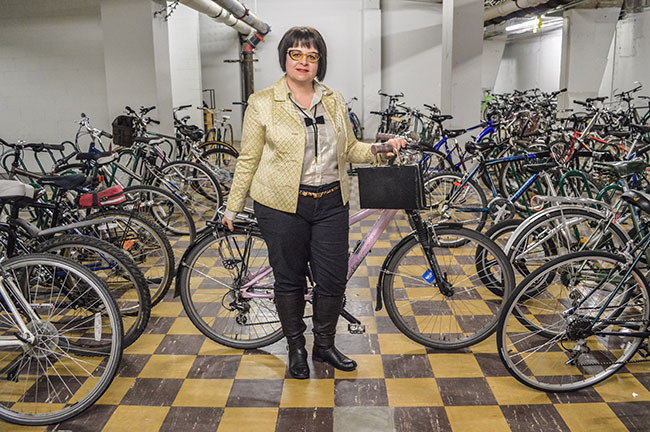 In fact, their origins lie with various stakeholders, in particular the City’s Active Transportation Policy Council, a team of 15 volunteers chaired by longtime advocate Tanya Paz. The Council gathers monthly to review and advise on infrastructure and policy, along with liaisons from City Council, the Transportation Department, Vancouver Park Board, and Vancouver School Board. “Through stakeholder workshops – where we consider the location of the existing bike network, businesses, community centres, schools, and other factors – we recommend streets as cycling routes, and in what order they should be built,” says Paz. “It’s also encouraging to see the City streamline construction work by combining utility and active transportation route upgrades more often” (such as the upcoming SW Marine Drive Bikeway Improvements). “While our policy work isn’t everyone’s cup of tea, it’s also important,” Paz stresses. She points to a comprehensive Complete Streets policy her team has been developing with city staff, which – if approved – would see active transportation become a standard built-in component of any street design or upgrade; not just an add-on item. While details are still vague, the City finally expects to roll out their long-delayed bike share scheme in late spring/early summer. 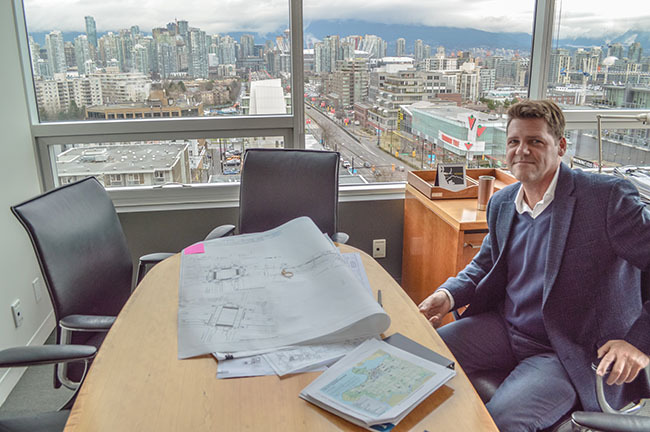 As a result, LaClaire and his team plan to move quickly on a number of projects in the city centre, as well as preliminary study and consultation on Commercial Drive. Over and above the 12 routes identified in the five-year plan, staff will also be completing safety upgrades to dozens of other intersections, as part of their ongoing, $3-million spot improvement program. 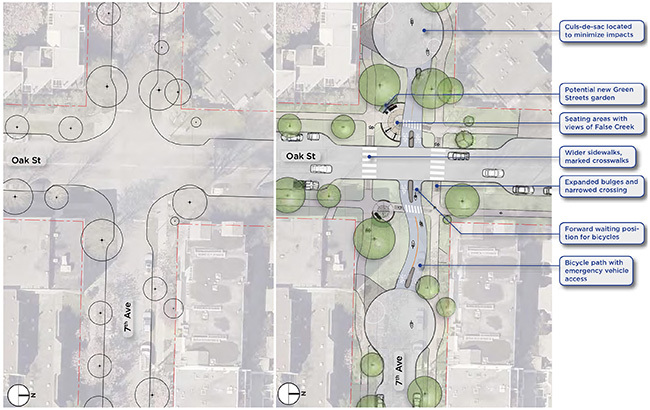 These important transformations – such as the intersection of Oak and 7th – acknowledge that bike networks are only as functional as their weakest link. “We also continue to work with private partners on street improvements as building developments are completed,” says LaClaire. To illustrate this, LaClaire pulled out plans for a pair of one-way cycle tracks on East 1st Avenue, complete with a fully-protected intersection at Quebec Street, both of which will be built in correlation with Concert Properties’ adjacent multi-use development, and are considered best practice in Europe’s premier cycling cities. Next year will also see the dissolution of the City’s dedicated Active Transportation Branch, and the folding of existing staff into two sections of a wider Streets and Transportation Department: planning and design. This is another surefire sign that walking and cycling will no longer be considered discretionary items, but rather a fundamental element of all transportation projects managed by the City. The idea of a complete street on Commercial Drive may be the most contentious idea in the five-year plan – to a few squeaky wheels, at least. 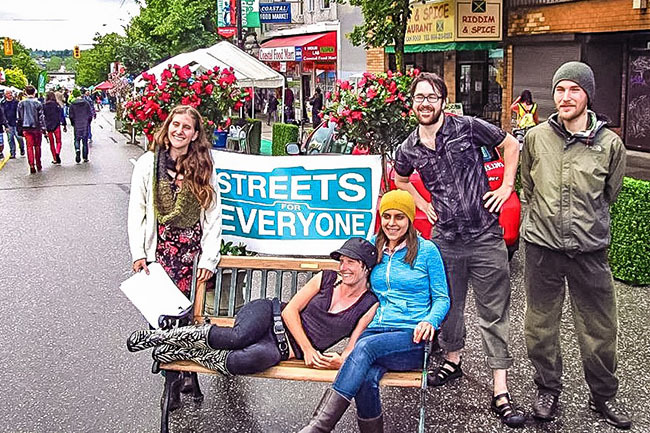 However, it provided the impetus for a group of East Vancouver residents to found the grassroots, non-profit initiative Streets for Everyone in early 2014. By forming partnerships with community organizations and local businesses, the diverse group hopes to galvanize the latent demand for better walking and cycling on The Drive, and make it more visible and palpable to city staff as they move forward with their study and consultation phases in 2016. “It is clear to us that as a public space, Commercial Drive doesn’t work for everyone, especially those who don’t drive a car,” says Sarah FioRito, one of the group’s founders. A recent report by Slow Streets reinforces that very idea, finding just 2% of the people shopping on The Drive arrived by automobile, despite being handed two-thirds of the right-of-way for car movement and storage. “A complete street on The Drive is about equality more than anything,” FioRito says. With limited time and resources, the group has already made a bit of a splash, garnering 3,000 signatures on an online petition, a rotating cast of 20 to 30 volunteers, a mailing list of over 1,000 supporters, and the enthusiastic support of over 20 local businesses. 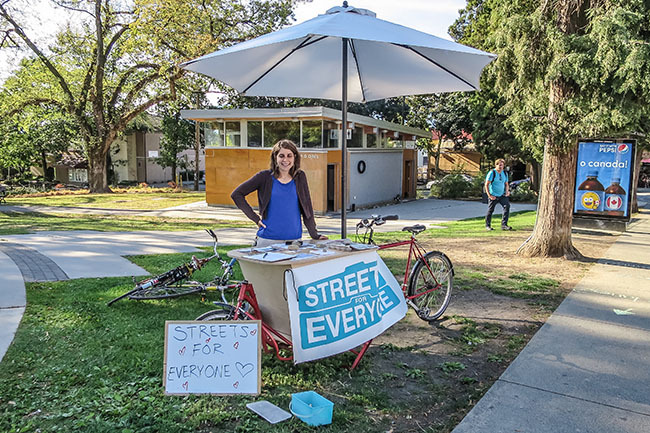 “For 2016, Streets For Everyone hopes to build on past work by actively engaging the residents and merchants of Commercial Drive, doing creative outreach in the community using a cargo bike purchased with a Neighbourhood Small Grant from the Vancouver Foundation,” says FioRito. Perhaps the most encouraging part of this entire exercise has been the reaction – or lack thereof – compared to the adamant opposition officials experienced the first (and second, and third, and fourth) time around. In 2010, for example, Global BC ran a news story about the proposed Hornby Street bike lane, claiming it would act as Mayor Robertson’s “political graveyard.” Their dire predictions proved entirely unfounded, and – just five years later – they are singing an entirely different tune. Indeed, there have been very few dissenting voices, save the Non-Partisan Association, who continue to prove they are more interested in wasting time on minor wedge issues than actually governing a resilient, accessible, and competitive 21st century city. To us, this represents a genuine tipping point for Vancouver, where we have accepted that streets are for more than moving metal boxes at fast speeds. In that light – and with very little opposition remaining – a new protected bike lane every six months is the very least we can do. Mayor and Council get it. The electorate asked for it. And the business community wants it. Let’s make the most of these enviable conditions, and build something worth bragging to the world about.